It was early Saturday morning and I could already hear the wind whipping up waves on the beach at Airey’s Inlet. The terrible NRS weather curse didn’t look like being broken any time this weekend. In fact, as the team headed into Lorne that afternoon for the Stage One Criterium, we got word that there would be no time penalties on the General Classification (GC) for any riders who didn’t complete all 25 laps of the race. Race organisers felt the conditions were too dangerous to tempt riders into taking risks in order to stay in contact with the bunch, so, any rider who completed the neutral lap and at least one full lap thereafter would be granted the same finishing time as the lead group even if they pulled out of the race early. At first glance the course didn’t look like anything special on paper – a simple rectangle around one block of Lorne’s main street. However, anyone who didn’t check out the course properly before the race would have been in for a rude surprise. One side of the course ran straight up Bay Street which is 150m of climbing at an average gradient around 15%. Not too bad to get up once but getting up this wall 25 times in a row as fast as possible with about one and a half minutes to recover in between is a different story. A bit of a horror story for most of the field as it turns out. Did I mention it was a little bit wet? Photo credit: Con Chronis Photography. We built our race plan around Emma and Lizzie both of who enjoy hard, hilly crit races. We wanted the whole team to be present at the end of the race to keep the pace high in the final five laps and then Lizzie could launch a last-lap attack on the climb with Emma staying in the bunch to contest a sprint if the race came back together. The conditions while we tried to warm up were foul. Rain slashed in sideways underneath the bbq shelter we were huddled under while we got kitted up. The wind was freezing and I started to wonder if wearing leg warmers and possibly a puffer jacket for crits could be a new thing. After delaying as long as possible, the team headed out to do some warm up laps to check out the climb and the rest of the circuit. It was pretty clear why the decision to neutralise time differences was made. There were small rivers of water flowing down from the hills behind Lorne and across the road on the back straight and the road was soaked all the way back down the hill into a fast corner onto the finish straight. Kirsty, Lizzy, and Emma take the corner back onto the finish straight. Photo credit: Con Chronis Photography. We lined up under the start/finish banner and prayed for the rain to stay away while the wind whipped off the ocean and over the shivering bunch. The race kicked off and after an easy neutral lap, the bunch came back over the start/finish line and the race was on. We rounded the corner onto Bay Street and squeezed through the barriers into a single lane to start punching up the hill. Some hardy spectators cheered us along from outside the pub as the whole bunch got out of their saddles to wrestle their bikes up the incline. Each turn up the climb only took around 30 seconds but it was enough time for lactic acid to start screaming in the quads. The pace was pretty calm along the back straight but if you were caught out of position in the bottom corner coming back onto the main drag you paid for it as there was a nice little head wind waiting for you there. You really needed to be sitting protected in the bunch for this side of the course in order to arrive back at the pub relatively fresh for another go up The Wall. There’s not a lot I can really report on for this stage from inside the bunch, I think I only lasted about six or seven laps, but I ended up having a pretty good view of it from the sidelines! Our other Vie13 KOM riders stuck it out for the majority of the race. However, by the time there were six laps remaining, our only rider left was Lizzie and the field was whittled down to about seven or eight riders total. She looked comfortable, holding good position at the front the whole time. Bridget toughing out Stage One in summer kit. Photo credit: Con Chronis Photography. With one lap to go, Ashlee Ankudinoff from team Specialized launched a big attack on the final climb and held her advantage through to the finish, winning the race. Lizzie did a great job, sprinting in the reduced bunch for fifth place. Lizzie summed up the final lap of the race just after the finish: “I saw Ash go and knew I had the legs to follow, for me the race hadn’t felt that hard yet, but I was just so cold I couldn’t do anything. I couldn’t really feel anything at all!” Which probably summed up how a lot of people felt at the end of Stage One. See full Stage One results here. The road race on Sunday was scheduled to start in Lorne at 7.20AM and the weather was predicted to be just as tough as the prior day. It may not have actually been raining as we drove from Airey’s Inlet along the coast to Lorne but the roads were drenched from overnight rain and the temperature hovered just above zero. It’s always hard to get excited to race when you don’t even want to get out of the car but with a bit of banter and smack talk in the car park with the girls it wasn’t long before the whole team were kitted up, feeling frozen yet jazzed, we were ready to roll for a warm up just after 6.30AM. The neutralisation of any time gaps from the criterium the day before meant that the whole peloton was essentially on the same time on GC. This meant it was going to be difficult for any breakaway to be established – there just weren’t any riders in the bunch who it would be safe to let get up the road. If anyone established a good lead on the peloton there was a real risk they could end up winning the entire tour as well as the stage. We had a nice simple plan for the race. I was in charge of monitoring any early breakaway attempts on the first climb of the day which started pretty much on the start line and finished 10.9km into the stage. After that, we would all focus on riding for Lizzie, our protected GC rider, making the race hard for her as we got closer to the finish line as a tough finish to a long race suits Lizzie’s fitness and style of racing. The profile of the course was going to dictate how this race played out. After the 10.9km climb from the start to the first Queen of the Mountains (QOM) point, the road undulated a bit, then descended and was fairly flat until the first intermediate sprint around 50km in. Straight after the sprint we would climb again for more or less 15km, with a couple of short descents thrown in, until the second QOM point at Mount Sabine 65km in. After the second climb, the road continued to undulate for a few more kilometres before finally descending back down onto the Great Ocean Road for the final 40km back to Lorne. Stage Two road race profile. The temperature was stubbornly low as we lined up for the start, but the sun came out which at least gave the illusion that warmth was on the way. We set off on time and were under neutral control for a few hundred metres until we got onto the opening of the climb and racing kicked off. I was pretty nervous about doing my job properly on the first climb which really forced me to find my way up to the front – you can’t follow attacks if you’re in the middle or down the back. There were a few teams keen to push the pace, a couple of little attacks went early which I followed along with pretty much everyone else in the peloton. Still, it was only about 4-5km in when the pace ramped up and I couldn’t hang on any more. Luckily, I found a good-sized bunch to climb with and we crested the QOM and got to work rolling turns together and got back onto the main peloton at about 30km into the race, well ahead of the first intermediate sprint and the start of the next climb. Emma (far left) goes over the second QOM in the lead group. Photo credit: Photos by Ernesto. It’s worth mentioning at this point how cold and wet the race was. The sunshine at the start line hadn’t lasted long at all. We were climbing or descending through fog, mist, and rain for a big part of the day. Small patches of snow were lying next to the road at the top of the second QOM. My ride data showed that the temperature had dropped to zero by the top of the first climb and didn’t get above two degrees until we descended back to the coast 80kms into the race. Some people didn’t seem very affected by the conditions, happily riding along just in summer kit, while others definitely suffered. I couldn’t feel my face for the first two hours and struggled to eat properly. I’m pretty sure I was stuffing something into my face but it was hard to tell what was going on. “I think I’m chewing, but I’m not getting any feedback from my mouth,” I laughed hysterically to Kirsty at one point somewhere between the first and second climbs. As we approached the first intermediate sprint the pace picked up and didn’t ease up until we settled into the beginning of the undulating climb from Forrest to the top of Mount Sabine 65km into the race. At first the pace was under control and a big bunch was still altogether as we inched closer to the top. Then, at around kilometre 55, Justine Barrow from Total Rush attacked and Ella Bloor from Specialized went with her. No one else from the bunch responded and we watched them slowly ride away up the hill. Everything stayed together until about 5km from the top of the QOM when the pace ramped up and people started dropping off the back, myself, Kirsty, and Bridget included. Emma crests the second QOM a few seconds behind the lead bunch. Photo credit: Photos by Ernesto. Bridget and Kirsty climb together over the second QOM. Photo credit: Photos by Ernesto. Again, I got in a good little group of around eight riders and worked to stay with them across the top of the climb. We picked up Emma just after the top and descended fast back to the ocean to try and get back into the race. It took about 10kms of hard chasing but we spotted the back of the convoy before long and worked to get back on. Unfortunately, we made the catch just at the beginning of a pretty tough little 1.5km climb. Our group worked its way into the convoy of cars and started moving up but the pace on the hill was solid and not everyone had enough gas in the tank to get across. Unfortunately, Emma didn’t quite make it so in the end it was just me and Lizzie from the team who found ourselves in the group of 17 riders who would contest the final 30km of the race. At first, I just sat in for a little while trying to recover a little from the chase but Chris and Jess’ words from the team meeting were ringing in my head. I knew there was no point being in the front bunch for the finish if I was just going to sit in and do nothing. After checking with Lizzie to confirm the break had been reeled back in and no one else had got away, I figured it was time to try and make things hard to give Lizzie the kind of finish that might set her up for a good result. There were numerous attacks from other teams including Holden Gusto in the closing kilometres, and I threw in a few attacks of my own but I certainly didn’t stay away for very long. Each time I attacked, I would be caught and then dropped from the group straight away, back into the cars. I yo-yoed back and forth, each time clawing my way back through the convoy onto the bunch to have another crack. 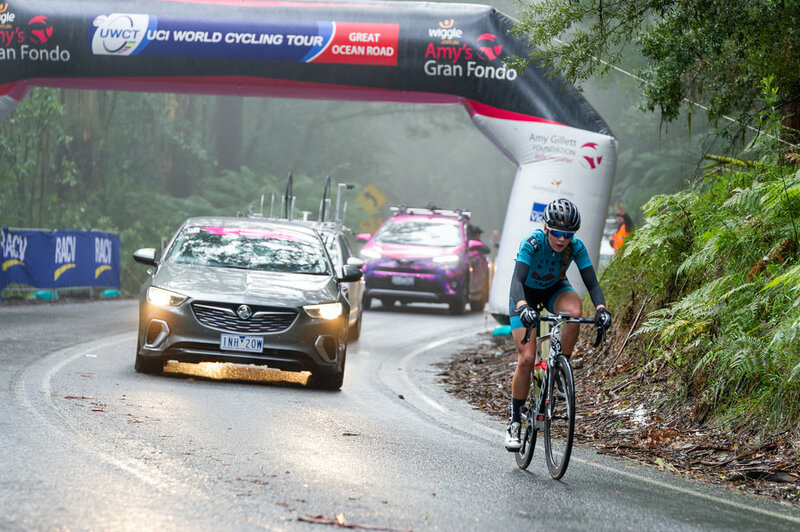 In the end it still came down to a small bunch sprint which was dominated by Ashlee Ankudinoff again with her team mate Sharlotte Lucas in second place and Georgie Whitehouse from Sydney Uni-Staminade in third. Lizzie finished in ninth place and I rolled over the line 20 seconds later in fifteenth. It was another great weekend, despite the conditions, and our little team is learning something new every time we race together. Plus it was pretty cool to have Lizzie finish in fifth overall on GC! It’s not long before we get the band back together for another shot at glory in the next round of NRS racing, the Tour of Gippsland in a few weeks. Until then! See full Stage Two results here.